The Lima Climate Change Conference closed with a deal this week – just barely. The difficulty of those negotiations, which ended up lasting two days longer than originally scheduled, proves that there are stark limits to the progress shown by the joint U.S.-China announcement on climate change. It took a great deal of political will to get that bilateral agreement finalized; it will take even more to negotiate a global climate change agreement ahead of the 2015 conference in Paris. 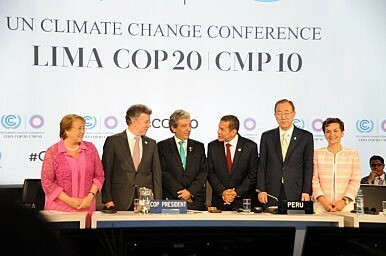 At heart, the Lima talks ground to a halt because of long-standing disagreements over how to allocate the burden of mitigating climate change. Developing countries, including China, continue to insist that the developed world should bear the lion’s share of the responsibility – and, more importantly, the cost – for preventing catastrophic global warming. China’s willingness to commit to an emissions cap by 2030 in its joint announcement with the U.S. does not indicate that Beijing will accept a responsibility on par with those taken up by the developed countries. On the contrary, Chinese officials continue to emphasize “common but differentiated responsibilities” as the guiding principle for a climate change deal. As has become traditional since the 2009 conference in Copenhagen, the U.S. served as a de facto leader for the developed world, while China took up a similar role for the developing countries. Thus, a month after their ground-breaking joint announcement on climate change, Washington and Beijing found themselves at loggerheads at Lima. The divide caused developing nations, led by China, to veto a proposed deal on Saturday, complaining that it placed too much responsibility on developing countries. The deal reached on Sunday (after 36 hours of emergency negotiations) wound its ways to a compromise. It requires all countries — developed and developing — to commit to cutting emissions ahead of the Paris climate change summit in 2015, but leaves open the extent of those commitments. One of the major issues, raised repeatedly at Lima, is that western countries are not living up to promises to commit to a Green Climate Fund designed to help developing nations adapt to climate change. Promises made in 2009 call for $100 billion in funding, from both the public and the private sectors, by 2020; this year, Green Climate Fund just reached the $10 billion mark in pledges (and only after significant pressure from developing countries at the Lima summit). Another issue is whether the eventual agreement will be legally binding or simply self-enforced targets. The framework provided by the Lima Accord relies mostly on “global peer pressure” (as the New York Times put it) to ensure meaningful commitments are made and met. Some in the developed world are pushing for more accountability while the developing world wants to maintain flexibility. In an interview published by Chinadialogue, Xie Zhenhua, China’s chief negotiator at climate change talks, emphasized that China is committed to playing a constructive role in emissions reductions – not because of international pressure, but because of its domestic situation. China’s climate change actions are driven by its promises to clean up pollution at home, and by the leadership’s commitment to a new model of “sustainable national development.” Self-motivation from China is indeed crucial in the fight against climate change, and has been one of the major missing pieces. Still, Xie’s remarks tacitly indicate that China will not be moved away from its bottom line by the “global peer pressure” of climate change talks. China Rejects Accusations of Stonewalling Climate TalksChina's President Arrives in Paris for Final Push on Climate DealBefore Paris Talks, China Outlines Its Plan for Tackling Climate Change China’s Climate Change Efforts: The Good, the Bad, and the UglyWhy Did China Opt Out of the Arctic Climate Change Statement?